A comprehensive expressed sequence tag linkage map for tiger salamander and Mexican axolotl: enabling gene mapping and comparative genomics in Ambystoma. Title A comprehensive expressed sequence tag linkage map for tiger salamander and Mexican axolotl: enabling gene mapping and comparative genomics in Ambystoma. Expressed sequence tag (EST) markers were developed for Ambystoma tigrinum tigrinum (Eastern tiger salamander) and for A. mexicanum (Mexican axolotl) to generate the first comprehensive linkage map for these model amphibians. We identified 14 large linkage groups (125.5-836.7 cM) that presumably correspond to the 14 haploid chromosomes in the Ambystoma genome. The extent of genome coverage for these linkage groups is apparently high because the total map size (5251 cM) falls within the range of theoretical estimates and is consistent with independent empirical estimates. Unlike most vertebrate species, linkage map size in Ambystoma is not strongly correlated with chromosome arm number. Presumably, the large physical genome size ( approximately 30 Gbp) is a major determinant of map size in Ambystoma. To demonstrate the utility of this resource, we mapped the position of two historically significant A. mexicanum mutants, white and melanoid, and also met, a quantitative trait locus (QTL) that contributes to variation in metamorphic timing. 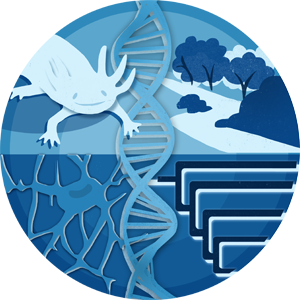 This new collection of EST-based PCR markers will better enable the Ambystoma system by facilitating development of new molecular probes, and the linkage map will allow comparative studies of this important vertebrate group.